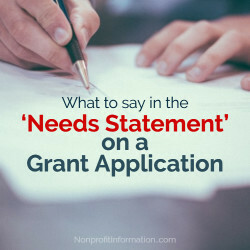 One of the biggest landmines on a Grant Application is the deceptively named “Needs Statement”. Why? Because you will blow it by sounding “needy”! It really isn’t about your needs at all, but is more like an executive summary of your application, with a special emphasis on how your nonprofit is going to help achieve the grantor’s goals. As mentioned, the biggest mistake nonprofits can make here is focusing on why they need the grant. Try and look at it from the grantors view. Whether they are a foundation or a government agency, they will have a mission and funders they are accountable for. Donors and taxpayers expect them to show an element of success at achieving this mission through the grants that they fund. As such, they are looking to fund sustainable programs that will achieve these mission specific goals. They key word here is sustainable! They want to see organizations that are on pretty solid financial footing so that if anything goes wrong, and they will, some of the mission is still fulfilled. If your needs statement reads like a rescue prayer, it will be booted to the bottom of the candidate list. Why would they consider giving cash to a project that is likely to run into financial difficulty when the program budget is overrun (a common occurrence) and therefore is unable to achieve its community goals? They will have nothing to show to the donors and taxpayers they are accountable for. So skip requests like this: “Without your funding this deserving group of schoolchildren will be without food during the school holidays.” And try more like this: “As you can see from our budget, we have a number of funding sources that have allowed us to achieve numerous successes in lunch programs across the state. We would use the requested grant to start a pilot program to provide similar quality lunches to students during the holiday period. This will help us both serve this underserved community and help reach your aim of reducing child malnutrition levels by ten percent citywide”. Other important tips? Make it readable and limit the industry jargon at all costs! Read it aloud so that you know that it flows smoothly. Crisp writing, white space and a few key graphs will improve your chances. It is also a good idea to use outside sources and facts to bolster your argument and not rely solely on emotional appeal. One or two personal stories can be a nice touch however. Lastly, I have found that what can set you apart from the rest of the applications is conveying a sense of both competence and humility. How do you do this? You can note possible barriers to implementation and plans to overcome them if they arise. You can win over a hesitant grantor by showing how you have been tripped up by such barriers before and learned from the experience. Don’t let this landmine blow up your plans and good work! Are Community Foundations Driving Radical Collaboration? Krista Tuomi is an assistant professor in the International Economic Policy program at AU’s School of International Service. She has worked for many years as a policy analyst in the areas of innovation and investment and recently her focus has been on best practice in the start-up investment climate, particularly on policy related to angel investing, crowdfunding and seed financing. Her passion for the field of innovation and entrepreneurship extends into her pro-bono work, which includes working with SCORE, Boots to Business, the Veteran Small Business Challenge Competition, Syracuse's Institute for Veterans and Military Families, and the Angel Capital Association.